Anyways I happy she did. Because I can assure you, this navy blue blazer is my first, but definitely not last purchase. I was always a person wearing jackets and I am very fussy choosing them. 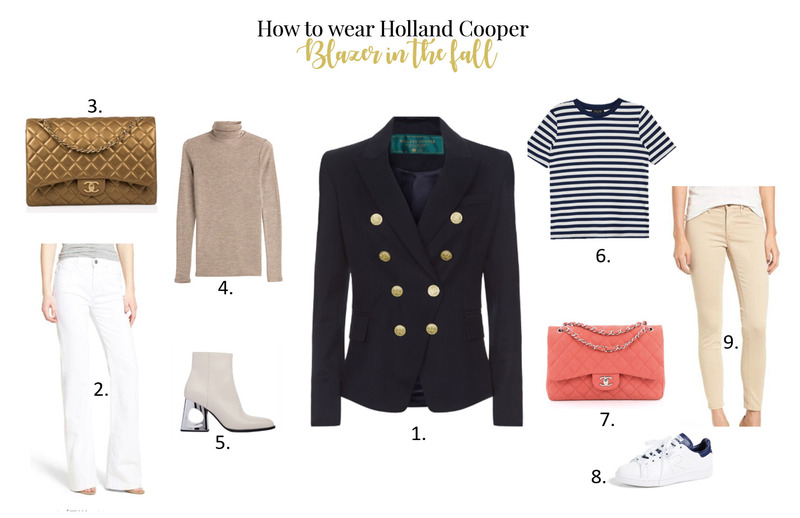 There are few rules I never ever break and this Holland Cooper jacket ticked every box straight away. The only doubt I had was the colour. I couldn’t choose between navy blue and blush pink. Even though I love blush pink, navy blue in the end won as I believe a classic high quality jacket in navy should never miss in anyone’s wardrobe. So here are my few simple rules. My general rule about fabric is a no brainer here really. I absolutely love that my Holland Cooper jacket is made of wool. It must fit like a glove. There are three main areas of concern. First are shoulders and upper arms. when you hug yourself, it can’t be uncomfortable. If it is, you need a size bigger. The second area is around waist. You should be able to close the jacket smoothly and it should not at all change the shape. If it starts to open up slightly around chest area, then it is too small. The third area is back, particularly around waist and just above your bottom. Your jacket must hug your lower back and top of the bottom like it was made for your. I should not pull or stick out anywhere. My problem is, that I have quite wide shoulders and smaller waist. So many times, when I buy a jacket I go size bigger in order for achieving perfect fit around shoulders. Then I go to the tailor to take few cm in around the waist. If you are happy to do so, fine. If you don’t want to spend extra money, make sure your jacket fits in all the places just right. ast thing is, how many pieces you can wear this jacket with? Is it versatile enough? Navy blue is one of the basics so if you don’t yet have one, maybe it is time to invest. A little bit about my choice. The fabric is 100% wool with 100% satin lining. It is double breasted and the golden buttons feature Holland Cooper logo. I love the fitted cut as it hugs the figure in all the right places. Also, even though it is double breasted i really like that you can only close it on one button. It is actually very similar design to this famous Balmain blazer everyone want to get their hands on. On the pictures I was wearing it with beige turtleneck sweater by Uniglo, white jeans and Chanel bag. Even though you can’t really see the boots, I was wearing gold ankle boots by Minelli. If you still don’t have anything like this in your closet, Holland Cooper jacket in can be your next choice.